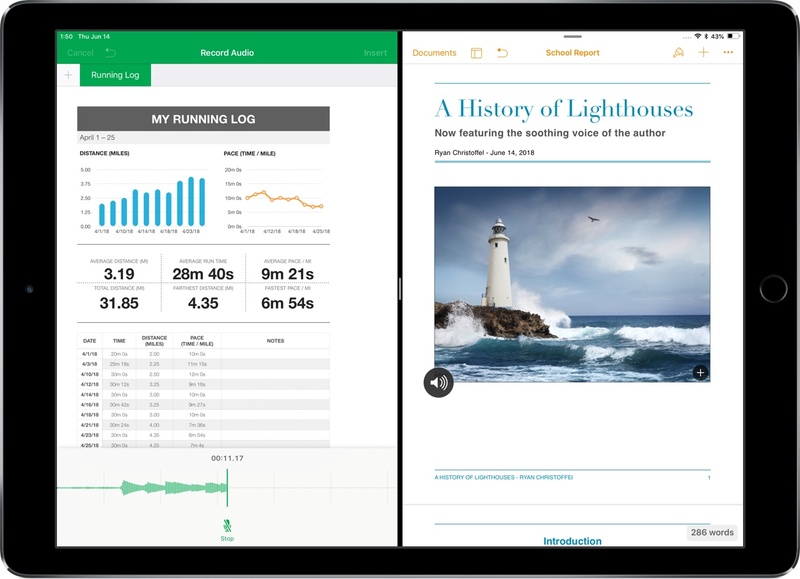 Apple updated its iWork suite for iOS today to version 4.1, bringing a variety of small improvements along with one centerpiece feature: support for audio recordings. Pages, Keynote, and Numbers have all added the ability to record audio in-app that is saved inside your document. The process for this is simple: hit the plus icon to open the content menu, then select the tab that looks like a photograph, after which you'll see a new 'Record Audio' option. There's a special UI that pops up from the bottom of the screen whenever you're recording an audio snippet, which at first only includes a record button. After you've stopped recording, you'll have the ability to preview your recording, add more audio to what you've already recorded, and edit clips by trimming, deleting, or recording over portions of them. Once you're done with a recording, hit the 'Insert' button in the top-right corner and you'll see your audio presented as a small, round icon matching iOS' system volume icon. This icon can be picked up and moved anywhere inside your document, working especially well as an elegant partial overlay on top of existing content. Tapping the icon will engage audio playback. While the in-app recording system is fine, I'm thankful that iWork also supports importing existing audio files using either drag and drop or the Files UI picker. You can also export audio recorded in an iWork app using drag and drop, or by selecting the file and hitting the Share button in the contextual menu. Outside of the new audio-focused features, today's update brings only a handful of smaller improvements. Keynote users will be glad to hear that you can finally edit or create new master slides on iOS, something the Mac version has long been able to do; the app also lets you export presentations as a movie or images. Pages' Smart Annotation feature has been upgraded with the ability to stretch and wrap as you make edits, and the app now enables adding colored backgrounds to documents. Following the introduction of support for LaTeX and MathML notation in Pages 3.1, now Keynote and Numbers gain that support too. If you prefer using the Apple Pencil as a navigation tool for scrolling, all iWork apps now have an option in Settings you can toggle for that behavior. There are also new shapes available in all three apps, new chart design options, and more. iWork for Mac has been updated as well with most of the minor improvements of the iOS version, but the audio recording capabilities are not included. iWork 4.1 isn't a major update, but it's a welcome one. Apple continues iterating on Pages, Keynote, and Numbers regularly, with a special emphasis on iOS improvements, and I've definitely seen my iWork use increase as a result.